Real Estate Marketing Automation Helps You Generate Leads, Saves You Time and Keeps You in Front of Prospects. Why Aren't You Using It? - Home Junction Inc.
Real Estate Marketing Automation Helps You Generate Leads, Saves You Time and Keeps You in Front of Prospects. Why Aren’t You Using It? Real estate marketing automation is an amazing tool for brokers and agents and frankly, if you are not using it, you could be missing out on several key rewards. As most people know, one of the basic rules of sales and marketing is to keep in constant touch with your prospects. “Consistent repetition yields results” is the mantra of one famous marketing expert. McDonald’s spends millions running the same commercials over and over again. Proof that they don’t expect you to see a Big Mac on TV, jump out of your chair and drive down to their restaurant for a hamburger. It’s repeated exposure for top of mind awareness. So that when you do want a burger, you think of McDonalds. Here are other problems with maintaining a consistent marketing campaign. Who’s got the time? And what content to include? Here’s the solution – real estate marketing automation. Real estate marketing automation is a game changer. Take the ListingLeader real estate marketing automation program offered by Home Junction, a real estate data and technology company. Home Junction staff has decades of experience in the field of real estate marketing. They know the issues facing agents. Undoubtedly, consistent marketing is one of them. Here’s the solution presented by Listing Leader. It’s a multi-faceted program that keeps you in front of prospects on a consistent basis…and does a whole lot more. Let’s start with the email marketing. Listing Leader has developed a program where all an agent has to do is subscribe, provide a photo, logo and upload their contacts. Listing Leader then pulls local market area statistics, the agent’s personal listings, new Sold and new Actives into an attractive email format. Homes sales going up in the area? A Market Summary included in the email, will share whether now is finally the time to buy or list a home for sale. Included in the email blast is a link back to a web page, or “microsite”, that includes even more relevant market data. Recent homes sales. Direction of home prices, etc. That’s huge. Those numbers are hard facts. 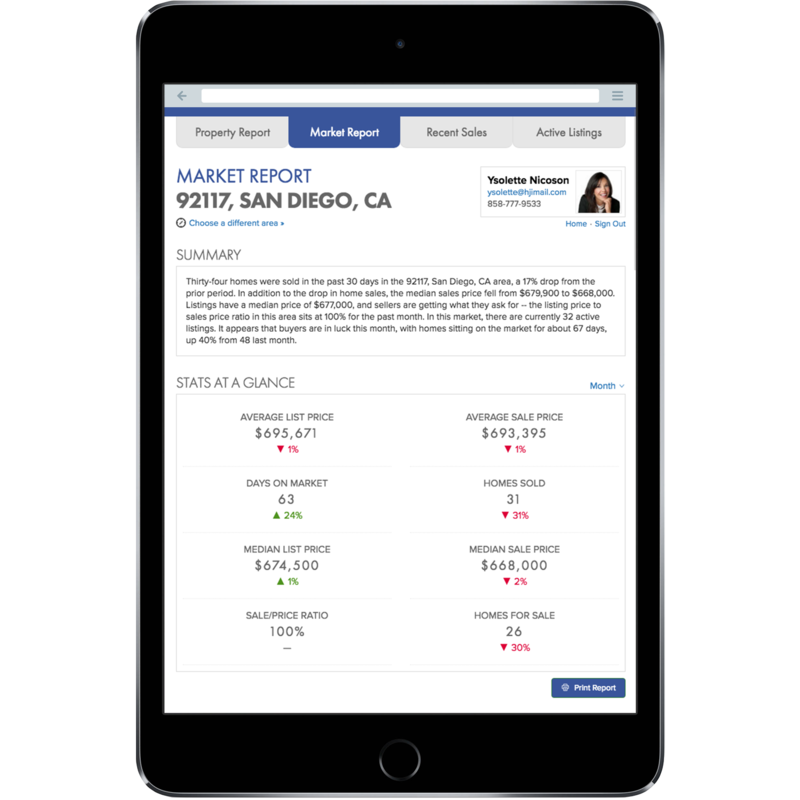 Local real estate market data that can persuade a buyer or seller to take action. Every email also offers the recipient to check their home value. It is the power of repetition! In addition, Listing Leader has designed their marketing software so that all of this information is easily printable. All the design and content are already created for you. Use the Print Report for marketing with the seller package, buyer package, take it to an open house. Or place that information in their brochure boxes. It’s ready to go with the push of a button. As consumers read all this important data and see events taking place in their neighborhood, at some point, many will be compelled to act. The agent sending them that valuable market data! Since all of these marketing efforts are computerized and tracked, there is data generated by the activity of prospects opening those emails. This is more than just how many people opened an email or maybe clicked on a link. With Listing Leader, an agent can view the activity of each individual on their email list. For example, they might see Johnny Homeowner is repeatedly opening the email and repeatedly going to the microsite to check out market conditions. He clicks on several charts – recent home sales, the direction of home prices, etc. He goes back again two days later. It sure is obvious. Johnny Homeowner’s status just moved from contact to “hot” prospect. This guy has market interest and potentially market questions. It is time to give him a call. Offer him more information – Timing is everything in marketing. That phone call when a prospect is actively seeking information, might just be the catalyst to start the listing process. Home Junction also knows that it can be difficult and time-consuming for agents to come up with social media posts on a regular basis. That’s constant work, and it’s necessary. About 90% of agents say they use social media for marketing purposes. Social is not a choice in this day and age, it’s a necessity. ListingLeader has the simplest real estate posting portal in the market today. In the program’s dashboard, there’s a section for posting social media content. The interface will display several options for an agent to post – Just Sold properties, Just Listed, Open Houses, etc. The agent’s social media accounts will be integrated with Listing Leader’s software. All the agent has to do is to click on the content they want to go out, and bazinga, it’s posted on Social Media. Nope. Not even close. Home Junction purposefully made the program extremely affordable. Check it out. Right now, ListingLeader is offering a low introductory price. You can easily sign up and quit at any time. This is 2018. An era of big data and amazing technology. Stop wasting time. Realtors should integrate technology for top of mind awareness and let the most adoptable real estate marketing automation programs do the necessary marketing work for you – ListingLeader positioning agents as the GO TO EXPERTS! https://www.homejunction.com/wp-content/uploads/Homejunction-logo.png 0 0 Bob Caston https://www.homejunction.com/wp-content/uploads/Homejunction-logo.png Bob Caston2018-06-26 16:27:482018-06-26 16:27:48Real Estate Marketing Automation Helps You Generate Leads, Saves You Time and Keeps You in Front of Prospects. Why Aren't You Using It?